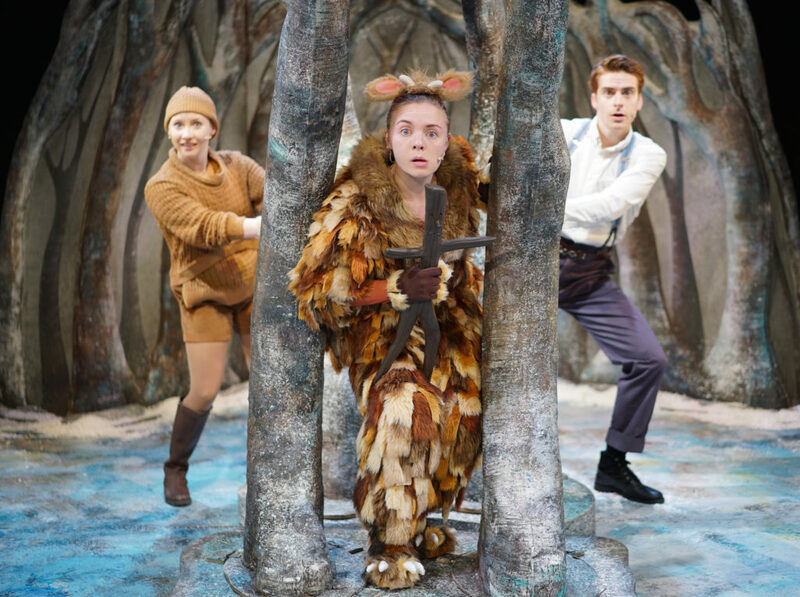 Tall Stories’ latest production of The Gruffalo’s Child is heart-warming and the perfect family show for the run up to Christmas. 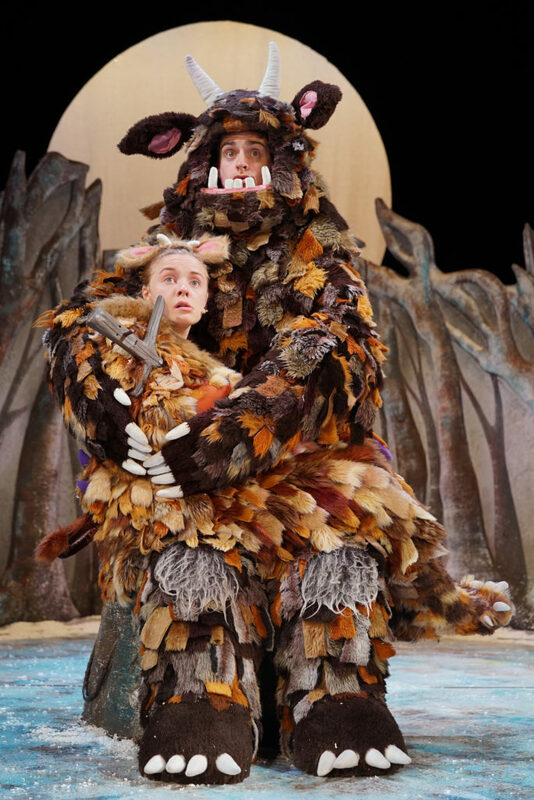 The musical is adapted from Julia Donaldson and Axel Scheffler’s book, and is the sequel to The Gruffalo. 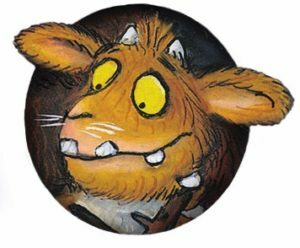 The story continues on from the first instalment, and this time follows the journey of the Gruffalo’s child, played by the wonderful Sophie Alice. She goes on a quest to find the Big Bad Mouse, and along the way meets all the characters we recognise from The Gruffalo: the snake, the owl, the fox and of course, the clever mouse. The cast is made up of only three actors, but their energy fills the stage. They work extremely well together, and are perfectly in sync in all their actions. The show utilises a lot of physical theatre and this is only successful because of how well the actors work together. Catriona Mackenzie brings the character of the mouse alive, also acting as a narrator throughout. Sophie Alice as the Gruffalo’s child, captures the childlike energy of the character. Andrew Mudie is particularly impressive, playing four completely different animal characters, each with his own distinct accent and personality. He easily seizes the audience’s attention, even the youngest of children, and engages everyone in audience participation. Composers Jon Fiber and Andy Shaw did a great job of transforming the short storybook into a musical. The music and lyrics are simple, but fitting to the show, and the catchy songs get stuck in your head for hours after you’ve left the theatre. Whilst some of the content can be considered a little dark, with the young Gruffalo threatening to eat all of the animals she meets, this is true to the original story and helps move the narrative along. The set (Isla Shaw) is very simple, consisting of a few trees and rocks that get moved around the stage to create new settings, placing the entire focus on the fantastic trio of actors. There is the perfect balance of audience participation, and the show is interactive enough to keep young children entertained throughout. With a running time of only 55 minutes, Olivia Jacobs’ direction delivers a very fast paced, delightful one act show. The Gruffalo’s Child is perfect for anyone looking to take their children for a Christmas treat, especially if they are fans of The Gruffalo books.